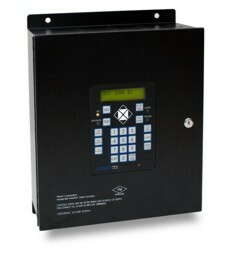 The AN104 is a single zone, low cost, full featured Spark Detection and Extinguishment control panel. It is ideally suited to single dust collector facilities. Standard features include sophisticated detector testing, waterflow monitoring and a baghouse heat detection and water deluge system. Air system shutdown and abort damper control are also included as standard features. The AN6400 is a true Distributed Processing Spark Detection and Suppression System supporting up to 64 Intelligent Zone Controllers. The Zone Controller can detect, spray and shut down the dust collector even if communications to the main control unit is interrupted. The AN6400 is the most powerful and versatile system available with each zone configurable to your unique requirements. 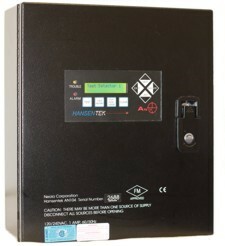 The AN6400 maintains a time stamped history for all activities which may be transmitted to a plant PLC or Computer - it even stores a Spark Count for every detector in the system. Automatic sensitivity testing, heat detector monitoring, waterflow monitoring and a variety of other sophisticated features are all standard in the AN6400.